(CNN) -- The United States hasn't caught soccer fever yet, but it's running a bit of a temperature. While U.S. athletes rate among the best in many sports, Americans are rarely mentioned when talk turns to the world's soccer stars. But many people, including agent Richard Motzkin, contend that the planet's most popular game will soon snap American ambivalence. They point to a steady upward arc in interest from 1986, when the U.S. last failed to qualify for the World Cup, to today, as the team prepares for a sixth straight finals bid. When Motzkin made the decision to begin representing soccer players in 1995, the U.S. didn't have a competitive pro league, and Major League Soccer wouldn't kick off for another year. "Many people thought it was crazy and questioned what I was doing with my life," said Motzkin, who now represents some of the U.S. national team's biggest stars, including captain Landon Donovan and Freddy Adu. Times were "challenging" at first, Motzkin said, but soccer was enjoying a popularity boost from the 1994 World Cup. Also, the domestic youth leagues had been swelling for years, as the Internet and expanded cable and satellite offerings made "the beautiful game" more accessible. Simon Kuper, author of "Soccernomics" and sports columnist for British newspaper the Financial Times, said the nation's interest -- and talent pool -- grows with its exposure to top-flight soccer. Of the 56 Americans named as possible selections for the 2010 World Cup squad, 26 play abroad, seven of them in England's top league. The Uganda-born Kuper recalled a time in sixth grade, circa 1981, when he joined a soccer team in Palo Alto, California. The team needed a name. Kuper suggested Arsenal, and was surprised no one was familiar with the English powerhouse. "You just didn't know what the best soccer looked like, but if you're a top soccer player [today], you're probably watching a little bit of Manchester United or AC Milan every week," he said. "Eleven-year-olds who play soccer know exactly who Arsenal is." American youngsters are even being sought out by top European clubs, including Chelsea, Manchester United and Everton, which are developing partnerships in the U.S.
Motzkin has enjoyed soccer's ascent. Three years ago he sold his agency to Wasserman Media Group, a marketing agency, and he's noticed dealings with clubs, agents, partners and sponsors becoming increasingly international. "There's more of a reflection that it's a worldwide marketplace," he said. Soccer isn't poised to take on the Super Bowl, Kuper said, but its top product rivals those of America's Big Four: the well-heeled NFL, NBA, MLB and NHL, whose lengthy seasons provide year-round entertainment. In 2006, the World Cup final -- with 16.9 million Americans watching, five million of them the Spanish broadcast -- beat out deciding games of baseball's World Series (16.3 million) and basketball's NBA finals (15.7 million). "Soccer is going to get a place at the top table," Kuper said, "but baseball, basketball and football aren't going to go anywhere." Evidence that soccer is shedding its second-class citizenry may lie in the ticket sales for the World Cup in South Africa. Speaking on March 4, U.S. Soccer Federation spokesman Neil Buethe said at least 125,000 tickets had been sold stateside, more than in England or Brazil and second only to South Africa. It's difficult to compare this year's ticket sales, Buethe said, because FIFA, world soccer's governing body, has changed how it sells them. The federation had about 10,000 tickets allotted for the U.S. team's first-round games in the 2006 World Cup in Germany -- not enough to sate the 40,000 applicants but enough to top the combined American sales of the 2002, 1998 and 1990 World Cups combined, Buethe said. "I think there's definitely been a noticeable change in the interest level, not only with fans but also with broadcasters and media in general," he said. ESPN approached the U.S. Soccer Federation last year and shared its plan to pump the World Cup into American homes. The network aired a handful of World Cup games in the 1980s and none in 1990, but showed every game of the 1998 and 2006 tournaments live. Americans can expect the same this year, as ESPN plans to put its muscle behind soccer like never before, said Seth Ader, the network's senior director of sports marketing. 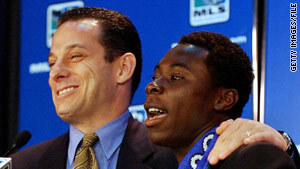 Agent Richard Motzkin, in 2003, announces a multiyear MLS deal for client Freddy Adu, then 14. The network already highlights top plays on "SportsCenter" and airs games from England's Premier League and Spain's La Liga, arguably the world's best domestic competitions. But the "tentacles" of ESPN's World Cup coverage will span platforms from programming to publishing, Ader said. It's a company priority. "You will definitely feel the power of ESPN's machine," he said. "We're going to spend more money than we ever have before for World Cups. ... If you looked at any single event that we've produced on ESPN, this one will get more marketing support than any other." To anyone doubting ESPN's ability to pique America's interest in sports it has shunned, Ader cites snowboarding, which he said would not be an Olympic event had the network not backed the X Games. "We know this works. We know this sport is the biggest in the world," Ader said. "All we have to do is sort of channel that energy that exists in the rest of the world, that passion, and make it relevant to a U.S. audience." The American team's opening match against England has the potential to be the most-watched soccer game in U.S. history, Ader said. It also helps that you don't have to be a soccer fan to enjoy the World Cup, much like you don't need to be a swimming fan to watch Michael Phelps. Not that there won't be plenty of fans watching. The team has independent groups, including Sam's Army, boasting thousands of members. The American Outlaws, a smaller outfit often seen sporting American-flag bandanas, began in 2007 as a group of buddies who held watch parties and traveled by the single busload to games, said President Korey Donahoo. They now have chapters in Washington, Los Angeles and other cities. Their ranks have risen to 1,800 paying members, about 50 of whom will be traveling to South Africa. We're going to spend more money than we ever have before for World Cups. "There's a groundswell. It's on a firm, firm foundation," Donahoo said. "I think if our U.S. team could improve on 2002, soccer could explode." Eight years ago, the United States advanced to the quarterfinals of the World Cup for the first time, but 2006 saw the team fail to make it past the group stage, despite managing to draw with eventual champion Italy. The U.S. side exhibited a similar dual personality in last year's Confederations Cup, losing badly to Brazil and Italy before toppling the African and European champions, Egypt and Spain, in back-to-back matches. Goalkeeper Tim Howard said big wins give the team confidence, especially after big losses. "That kind of gave us a confidence and belief that when things are down we can pick ourselves back up," he said. Howard said he believes a team of the United States' caliber can advance out of a group with England, Slovenia and Algeria. It's difficult, however, to become a "force in the later stages," he conceded. From a marketing perspective, ESPN does not expect to see the U.S. in the World Cup finals, Ader said. Indeed, some betting houses have 40-to-1 odds against it, but American soccer enthusiasts say the sport holds an important lesson for evolving fans: Success is not always qualified in victories. "We're a nation who likes winners," said Motzkin, Howard's agent. "For those of us who understand and appreciate the sport, we understand it's a huge accomplishment to get out of our group. Anything other than that, it's gravy." CNN's Ben Wyatt contributed to this report.